BioCare FemGuard is thought as a supplement for women’s health, as its nutrients address general health, menopause side effects, bone density issues that appear with aging, and cardiovascular activity. Based on quite an impressive list of ingredients, this supplement is designed to ensure hormonal balance, so that women experience fewer side effects of menopause. Bone density can also decay after the onset of menopause, so the product is targeted on ensuring healthy bone tissue, even later in life. We looked into this formula and this is what we found out. What Does BioCare FemGuard Contain? We notice that plenty of vitamins and minerals are included in this formula, so the product may be quite effective in promoting overall health. However, we would have loved to see more ingredients targeted at menopause side effects. For instance, black cohosh is not included in this formula, although it is one of the best traditional remedies for menopause. The recommended dosage is three capsules daily, taken with meals. The price for a bottle with 90 capsules, or one month supply is 22.45£. The company selling BioCare FemGuard does not offer refunds, but if you return products purchased unopened within 30 days of delivery, you can get your money back. 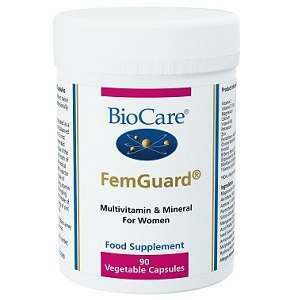 BioCare FemGuard is rich in vitamins, minerals and other compounds useful for promoting overall health. We did not see included, however, ingredients with a long tradition in treating menopause side effects, which is a minus of this product. Otherwise, this can be a great product for sustaining health during the onset of menopause, thus reducing the intensity of side effects, as well. Jackie Horowitz	reviewed BioCare FemGuard	on July 4th	 and gave it a rating of 3.